Dean & DeLuca has unveiled a new concept—separate from the renowned gourmet market—which seeks to slow down fast food consumption and highlight the artistry that goes into preparing food. STAGE, which opened yesterday at 29 Ninth Avenue in the Meatpacking District, was designed by the German architecture firm Büro Ole Scheeren. 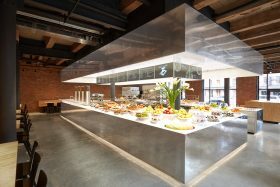 It transforms the typical buffet counter into a theatrical space that allows customers to interact with staff and watch their food being prepared.